FREE! 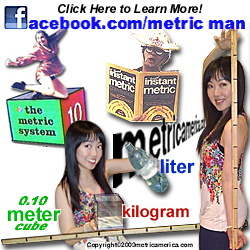 PRINTABLE METRIC POSTERS for TEACHERS, STUDENTS, CLASSROOMS - TABLOID SIZED Color or B/W - See Menu Below "PRINTABLE METRIC POSTERS"
Water Boils at 100 and at zero it Freezes! The International System of Units is called "SI"
and is the Metric Measurement used in America. ALL SIMPLY RELATED IN 10!